The Bauxite Hills Project is a DSO bauxite project located in far north Queensland, owned by Metro Mining Ltd. The project involves mining DSO bauxite, trucking to the barge loading facility, loading barges for transhipment to ocean going vessels in the Gulf of Carpentaria. 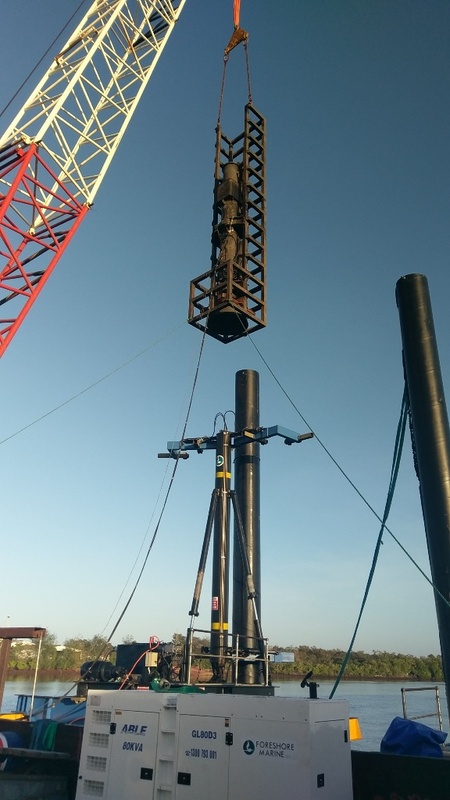 The project was undertaken using Foreshore Marine’s own in-house designed and fabricated “Backbone” barge-based piling rig, SDH62 Diesel Hammer in offshore leader and Foreshore Marine’s “Zoomlion” 100t Crawler crane. 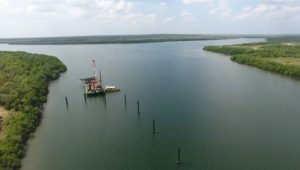 The Bauxite Hills Project is located at Skardon River in the Gulf of Carpentaria, approximately 95km North of Weipa in the far north region of Queensland. The remote location of the project was challenging and difficult to achieve, however with a team of trucks, planes and barges the project moved ahead and was completed successfully within the desired time-frame.